Standard features of the CCB SERIES include an on-board, backlit LCD display with easy to read 1 3/16” (30mm) display characters, an infrared remote controller, swivel hook, and a long lasting, easy to change lithium polymer battery (Li-Po). 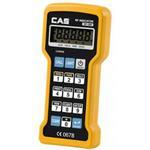 The backlit LCD wireless CRC-100 handheld indicator is easy to see and to use. It features a 15 key keypad (zero, tare, hold, stable, low battery), wireless Zigbee communication, memory for data management (70 items and customers), and RS232 connectivity.